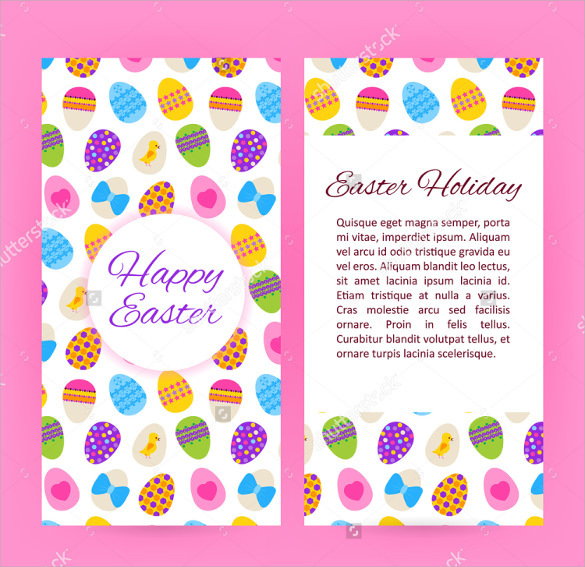 Easter brochures are mostly used to invite friends or near and dear acquaintances on Easter feasts organized on the Easter day celebrated each year. 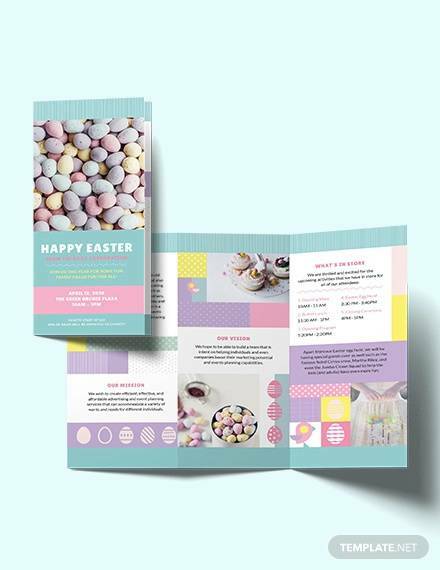 These Easter Brochure Templates are extremely picturesque and attractive, mostly designed by the use of PSD images with rich usage of bright colors and photo shop. These Event Brochure Templates mostly contain pictures and eye catchy images of the delicious and sumptuous food available on the festive occasion, or any other fun events which has been planned for the day. 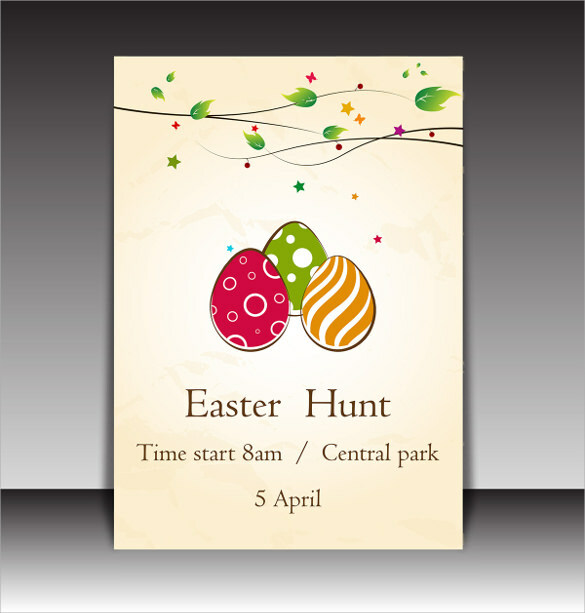 Easter brochures may also be used by certain tours and travel agencies to advertise their offers on Easter so as to boost sales. The background of this template is of grey color. 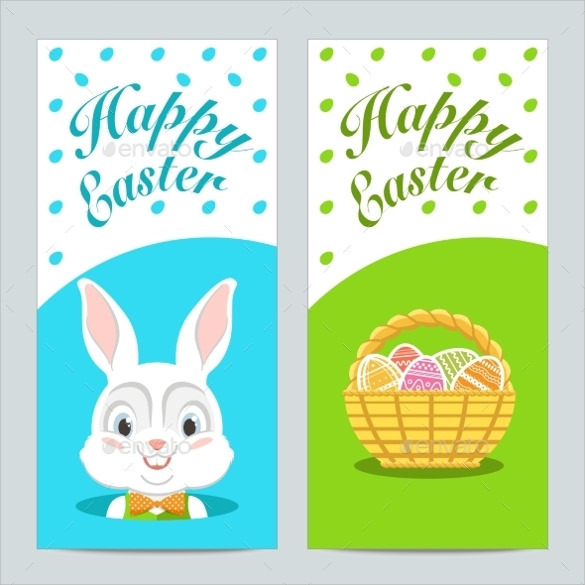 Upon the background, stand two rectangles, having images of a rabbit in a blue background and a basket with colored stuffs in a green background. This template is divided into two parts. 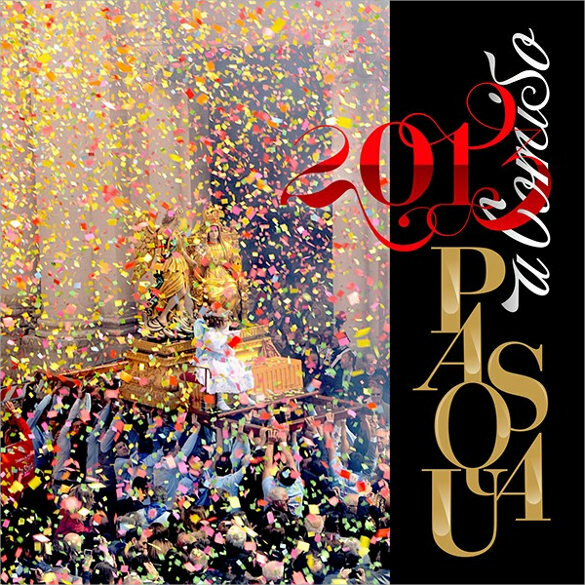 One is showcasing people celebrating Easter with idol of Jesus Christ in between and the other one having a black background with “Comiso 2013” written on it. This template has a multicolored background. A pink colored card is drawn on the background with a girl in white frock in the middle. “Broadway Fashions” is written over it along with “Home”, “Shopping” and “Services” in 3 separate lines. Two rectangles are drawn on a pink background of this template. On one, “Happy Easter” is written within a circle with white background and on the other, a few lines are written along with “Easter Holiday”. 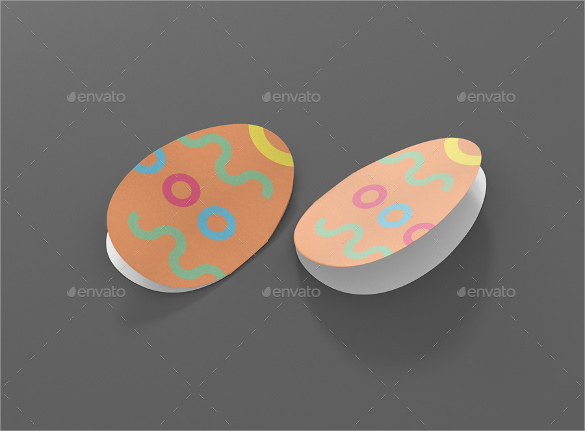 This template has a photorealistic egg shaped paper cut with a bi-fold. Its background is a color combination of black and grey. One can change the texture and color of this template. This template has a background having a combination of two colors, namely, grey and white. There is an image of a colored card with multiple folds, having various kinds of cakes, drawn over the card. This brochure has a color combination of black and grey background. It has a light pink colored rectangle with flying leafy branches of a tree, with colored stars around it. This template showcases an image of a wooden floor with a basket lying above it. The basket is having multicolored balls with a rabbit sitting among them and two photographs of two cute children. 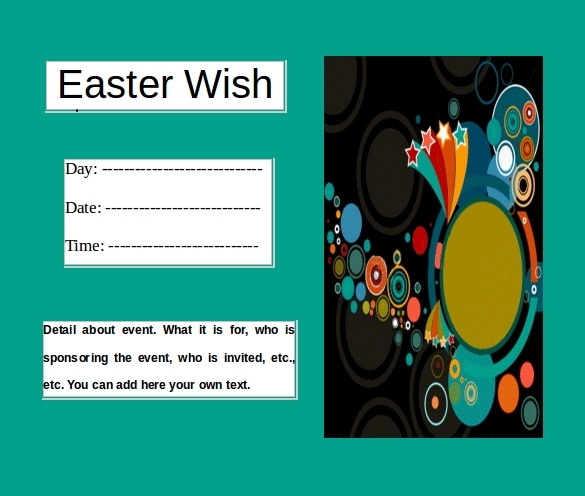 This template is suitable for cards for Easter wishes. It has a blue background with a colored image over it. There is space for writing the date, day and time of the event and other relevant details. This template comes in a white background with the cross logo on it. It provides spaces for writing the name of the church along with its address, telephone numbers and other related details. This template also comes in a white background. It also provides the name of the church along with the address and other relevant details. It has a description about Lent and the Cross. This template comes in a blue background. 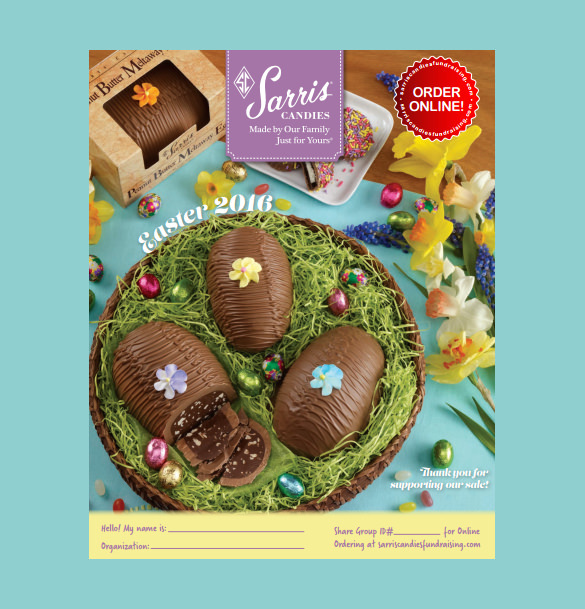 It has images of delicious looking chocolates decorated with colored plastic balls and plastic flowers. This brings a festive feel to one easily. 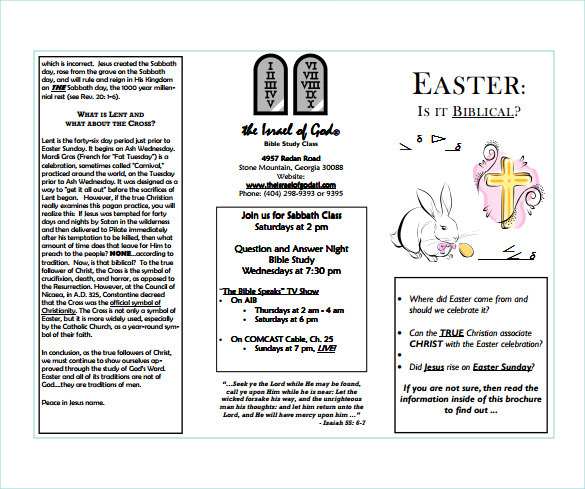 Most of the Easter brochure templates are designed with vibrant colors, featuring a high resolution display. They look like invitation cards that are decorated with images of flowers, chocolates, multi colored plastic strings. 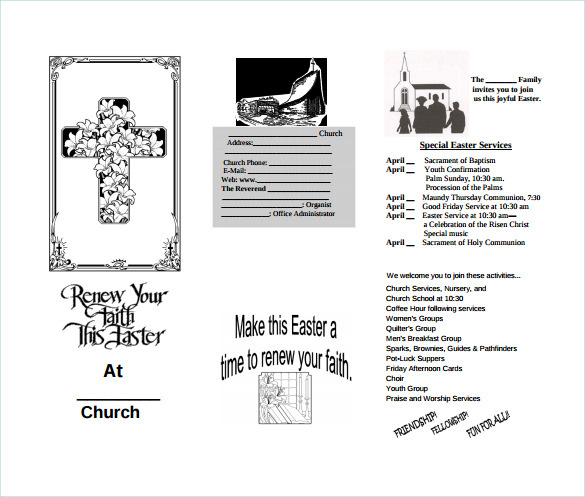 They provide information regarding the Easter, along with the church name and other related information. All these features uplift one’s festive mood.